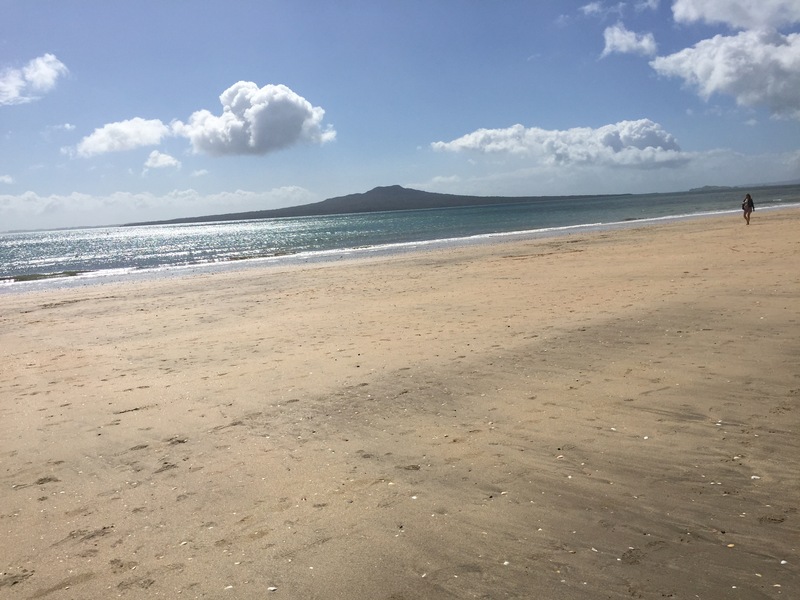 Today I walked the length of Takapuna Beach without my shoes on. The sun was out, the tide was low, the sand was smooth and firm. Being near to such beautiful beaches is one of the best things about living in Auckland. Walking barefoot on grass or sand is a natural way of “earthing“. Apparently this practice causes a transfer of electrons into the body, thereby helping to neutralise free radicals and reduce inflammation, so bringing about improvements in physiology. Research is still in its early stages but there is some evidence that earthing can help with numerous conditions including pain, insomnia, hypertension, cardiac arrhythmias and autoimmune disease. Certainly I feel in better health when I walk on the beach regularly, and often get new ideas for writing while there. For eight years I used to take this same walk once a week, rain or shine, accompanied by my mother and a dog called Khymer. Then Khymer and my mother both died, my husband and I were both ill, and I gave up doing it regularly. Now I am determined to resume the routine. Having Khymer with me only in spirit does have one advantage; I no longer have to start early in the morning to comply with local regulations about the times when dogs are allowed on the beach. Well done you, swimming already – still too cold for me! Or a walk with a virtual dog. Once upon a time you would nt walk on sand with bare feet.